Chi-squared testing is one of the most commonly applied statisticaltechniques. It provides reliable answers for researchers in a widerange of fields, including engineering, manufacturing, finance,agriculture, and medicine. 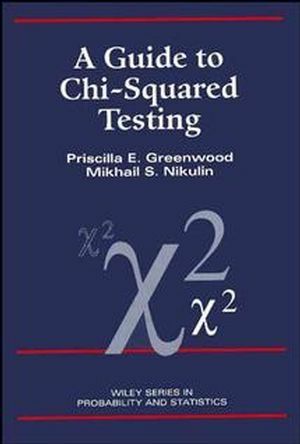 A Guide to Chi-Squared Testing brings readers up to date on recentinnovations and important material previously published only in theformer Soviet Union. Its clear, concise treatment and practicaladvice make this an ideal reference for all researchers andconsultants. Priscilla E. Greenwood is Professor of Mathematics at the University of British Columbia, Vancouver, Canada. A Fellow of the Institute of Mathematical Statistics, she received her PhD in mathematics from the University of Wisconsin. Mikhail S. Nikulin is Professor of Statistics at The University Bordeaux 2 and a member of The Laboratory of Statistical Methods of the Steklov Mathematical Institute at St. Petersburg. He earned his doctorate in the Theory of Probability and Mathematical Statistics from The Steklov Mathematical Institute in Moscow. The Chi-Squared Test of Pearson. The Chi-Squared Test for a Composite Hypothesis. The Chi-Squared Test for an Exponential Family ofDistributions. Can be used as a "cookbook" provided the students have some mathematical maturity.